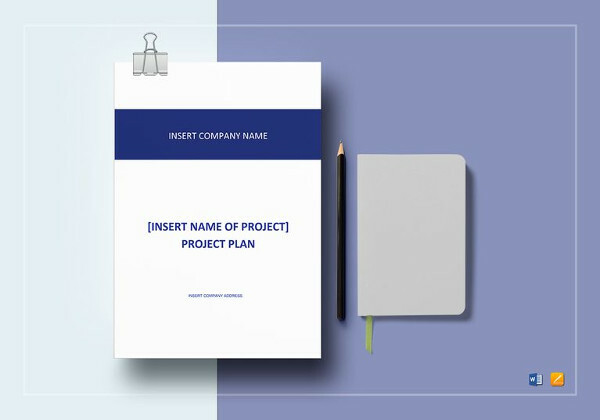 A work plan is created by an entity to assure that all the people who will browse through the document are informed of the details of a project or a process analysis. 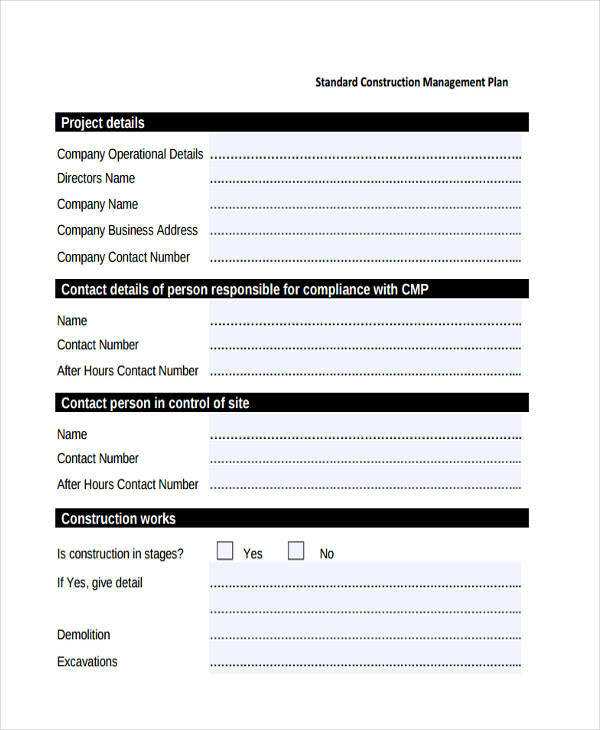 With the usage of this document, steps and procedures will be broken down into smaller details which allow stakeholders to be more aware of the things involved within a specific undertaking. 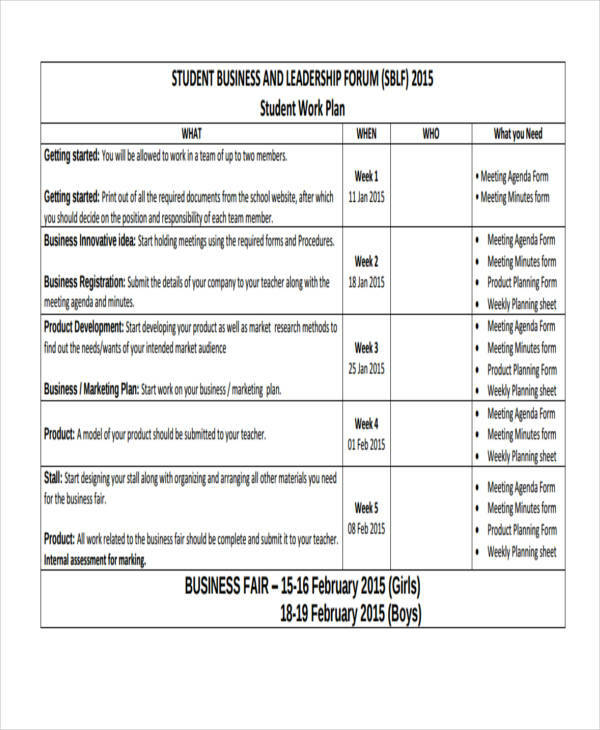 Work plans can be used in different environments but they are mostly effective in a simple business plan and academic setting. 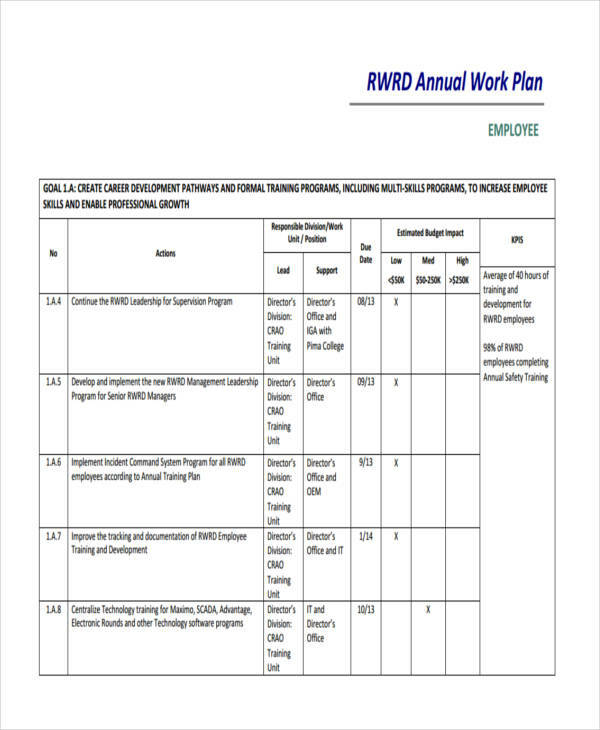 Since there are a variety of evaluation plans for work that can be created depending on the purpose that they may serve, we can help you select the appropriate work plan to use through the templates of learning plan and samples of job plan available for download in this post. 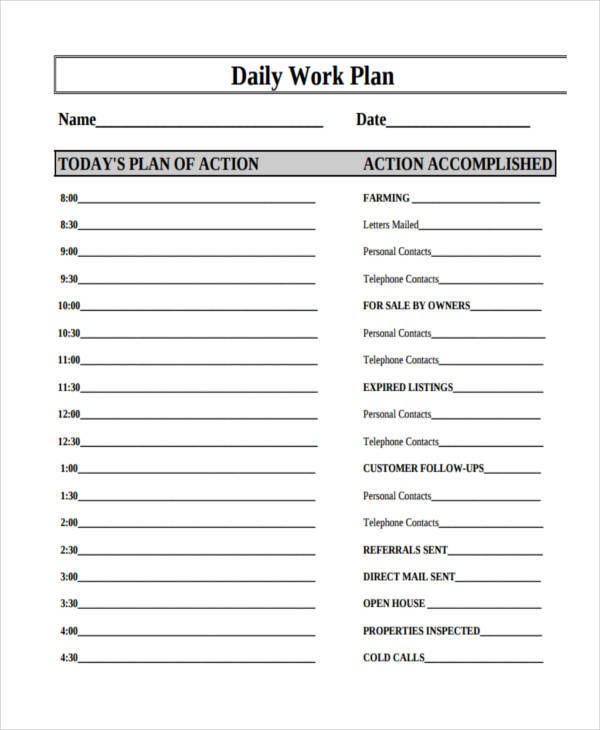 As an outline of the simple agendas, objectives and goals that a company would like to achieve in a given time period, a work plan should have all the details necessary for an entity to be effective daily plan and productive. 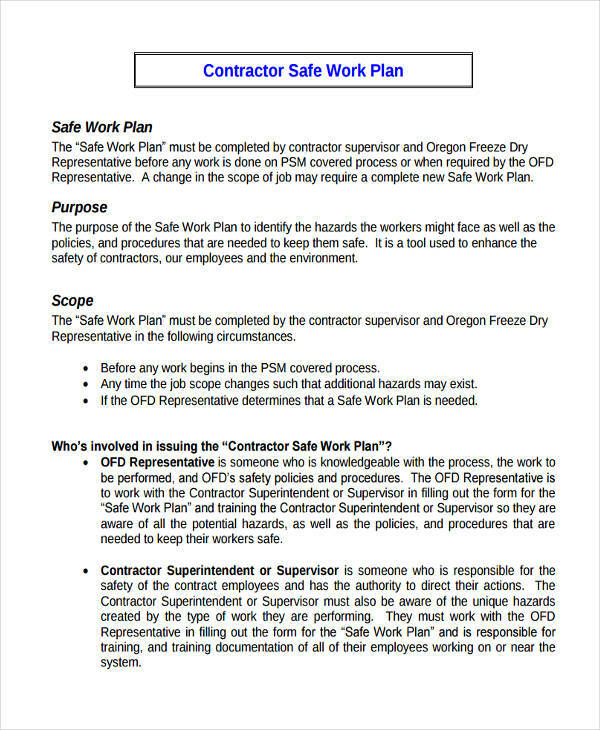 A work plan should provide a guide that the workforce may follow so particular undertakings can be executed accordingly. 1. 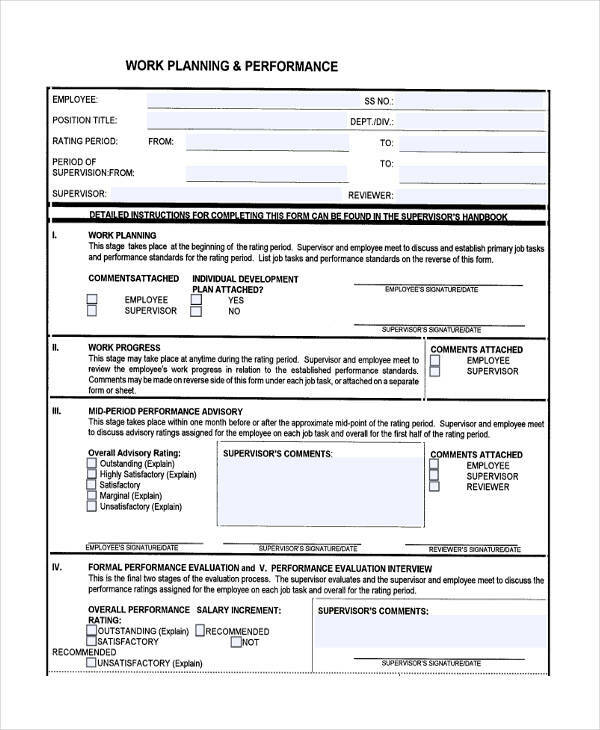 Be specific with the purpose or the reason on why the work plan has to be created. 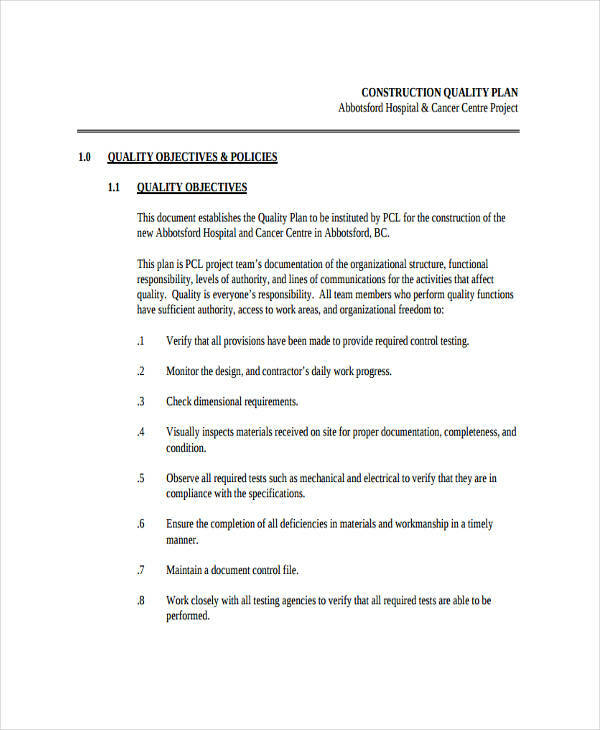 It is very important that you are well-guided by the information that you need to consider in creating the content of your work plan. 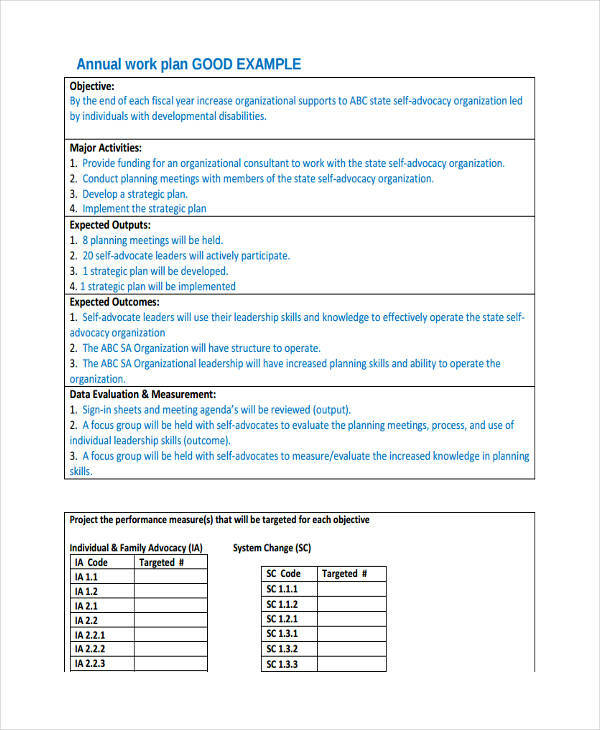 Being aware of the purpose of the management plan used for work processes will also allow you to target specific areas for development and improvement. 2. 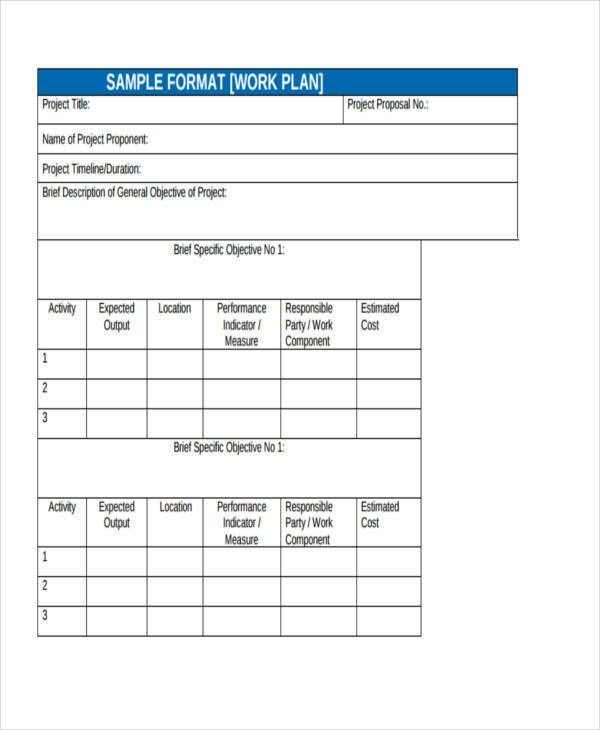 Create the introduction of your work plan. 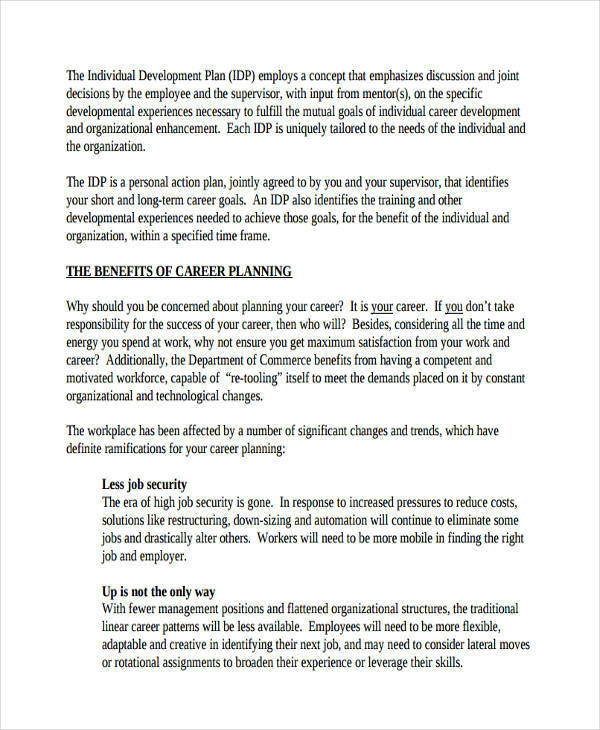 This part may include an in-depth discussion of your work plan’s purpose and the background as to which the work plan is necessary in the processes that you and/or other people are involved in. 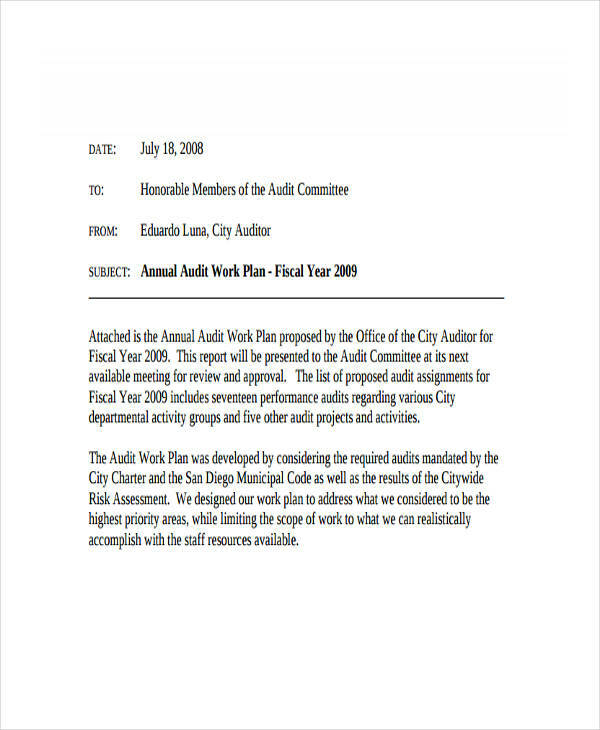 Work plans used in businesses are required to have a background discussion so the entities involved in the transaction and their work functions are properly stated. 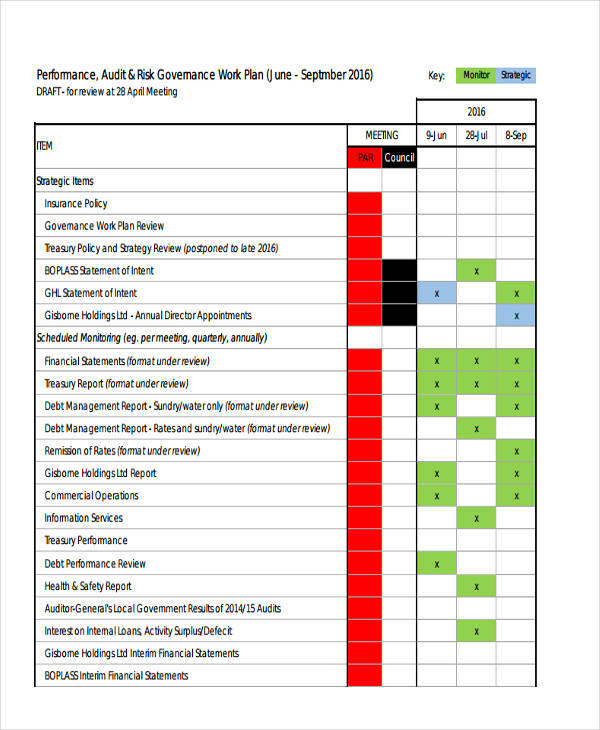 You may also see implementation plan examples & samples. 3. Your goals and objectives must be properly stated. 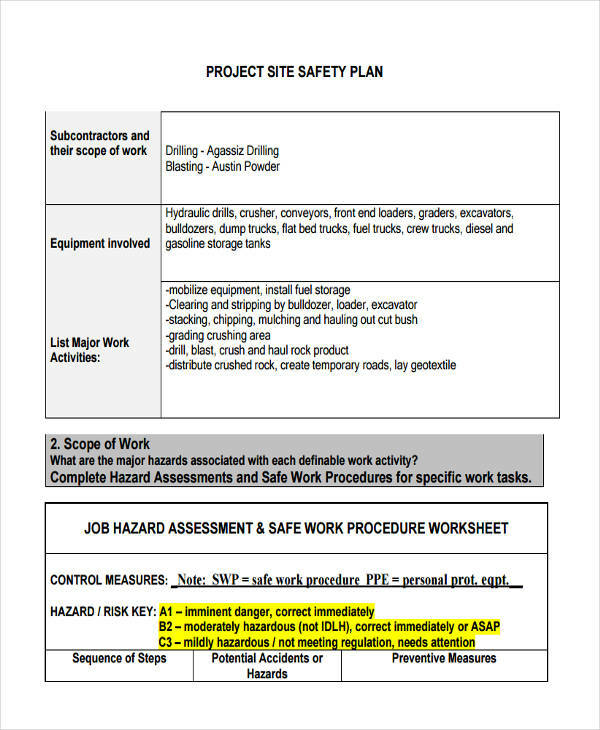 It is important for a work plan to provide information about the things that are needed to be achieved by the entity to whom the risk plan for work is for. 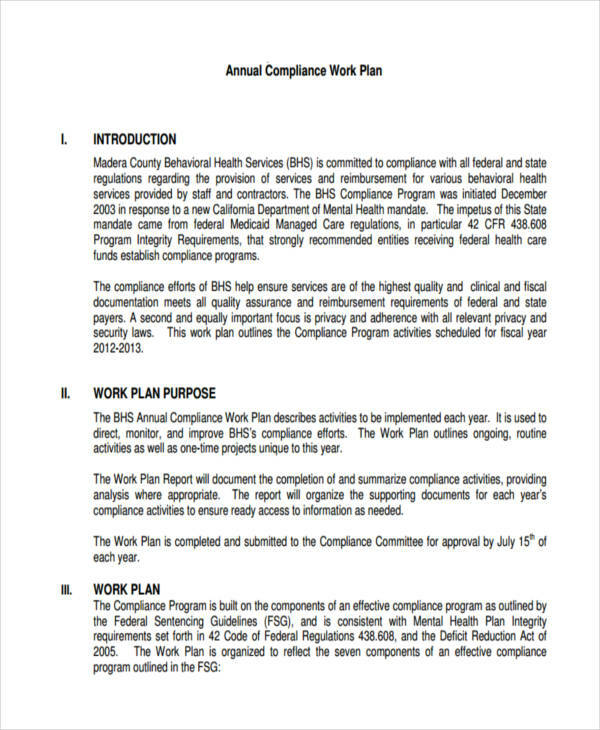 A control plan can only be highly effective if it is measurable and time bound. 4. Properly allocate your resources. 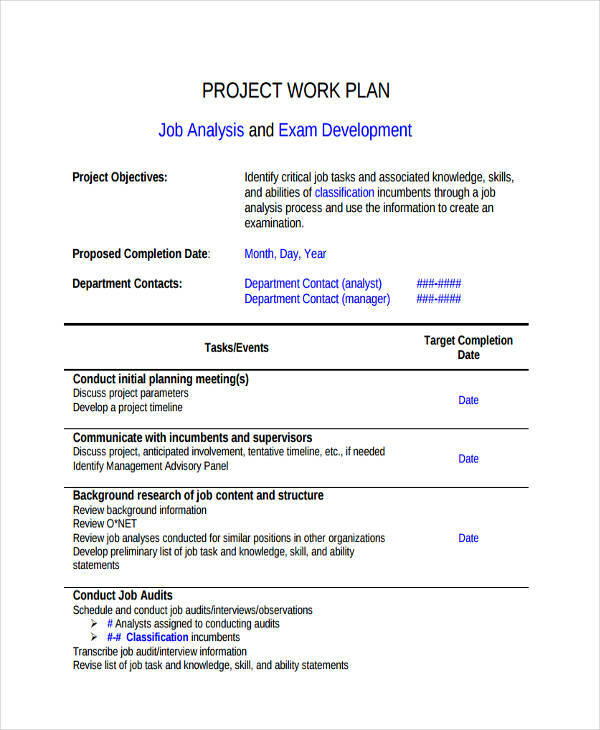 You need to be able to list down the resources that you have which will help you achieve the content of your work plan. 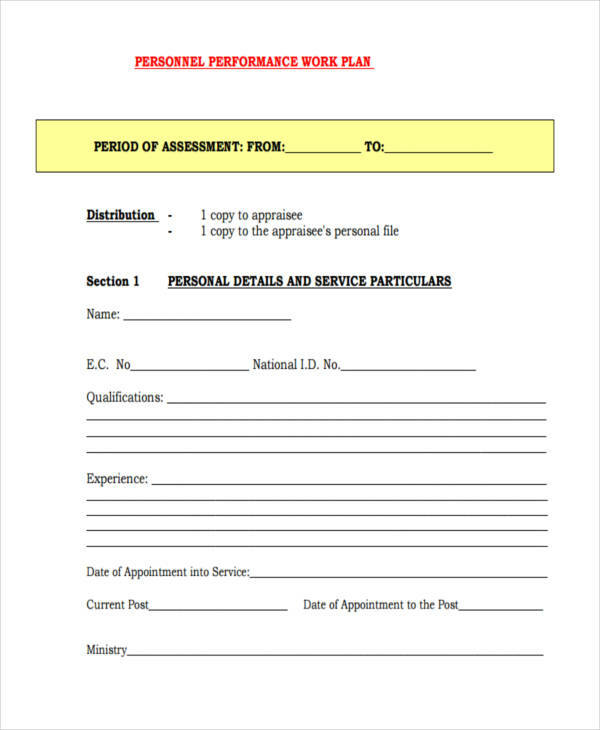 Having a designated usage of your resources will allow you to assessment plan an items that are relevant to your needs. 5. Identify threats, risks, and constraints. 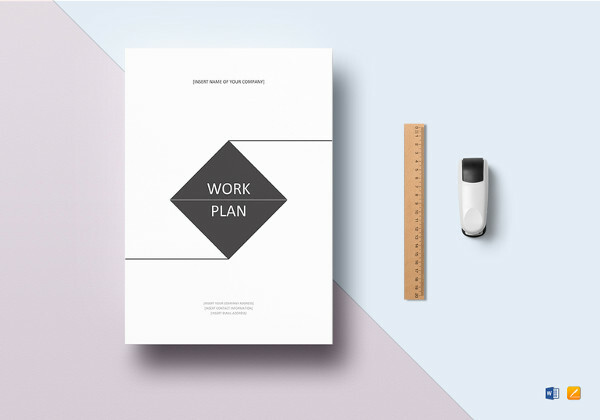 A work plan does not only rely on the internal factors present within a company. It should also be ready to face external factors like threats from other entities, the risks of executing call to actions and the constraints or obstacles that are needed to be faced in every step of the work plan. 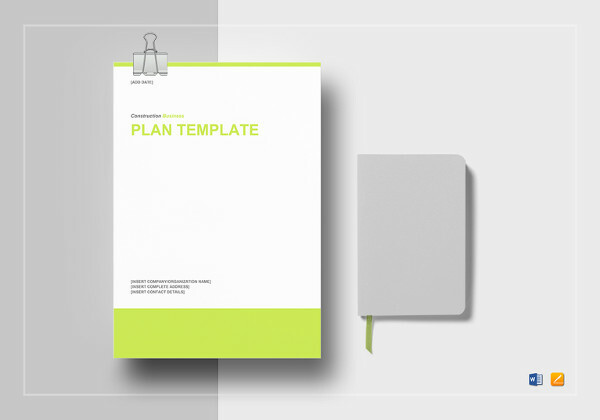 You may also like advertising plan examples & samples. 6. 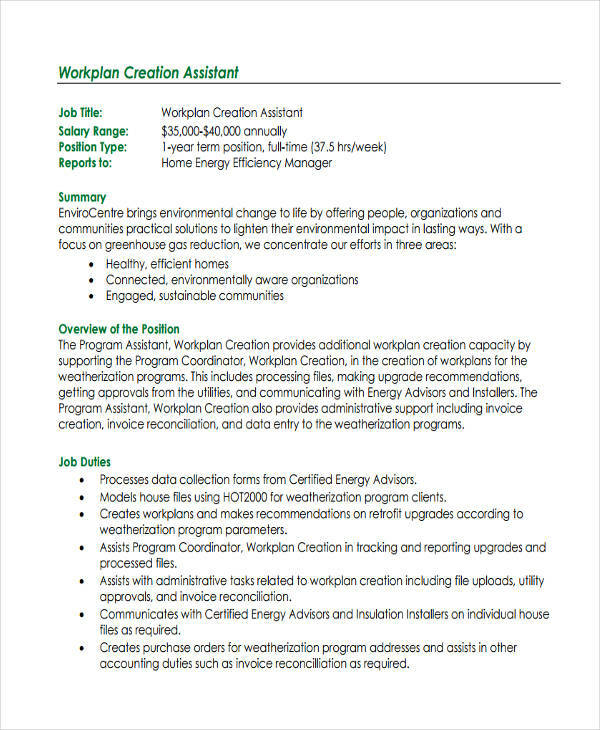 Provide specific tasks to the workforce. 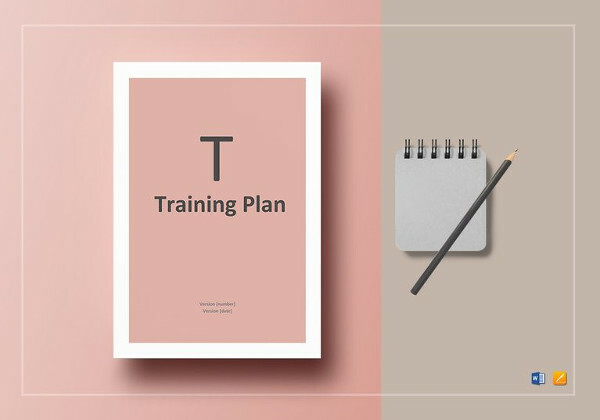 If a work plan will be used in a business setting, it is essential for you to assure that the tasks are properly disseminated to the employees of the business based on their qualifications, abilities and competencies. There are projects that require the participation of a number of people. 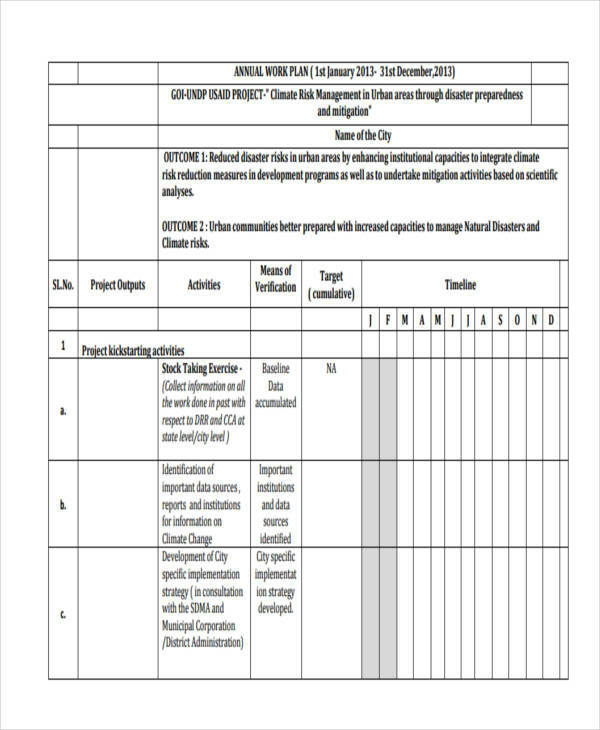 With this, proper allocation of tasks should be implemented. 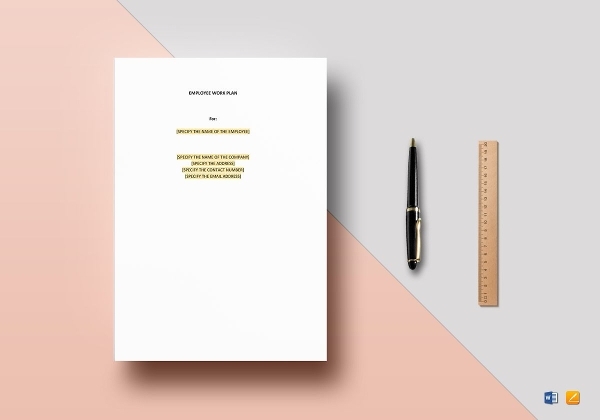 Academic projects are usually guided by criteria that are needed to be achieved to assure a passing grade. 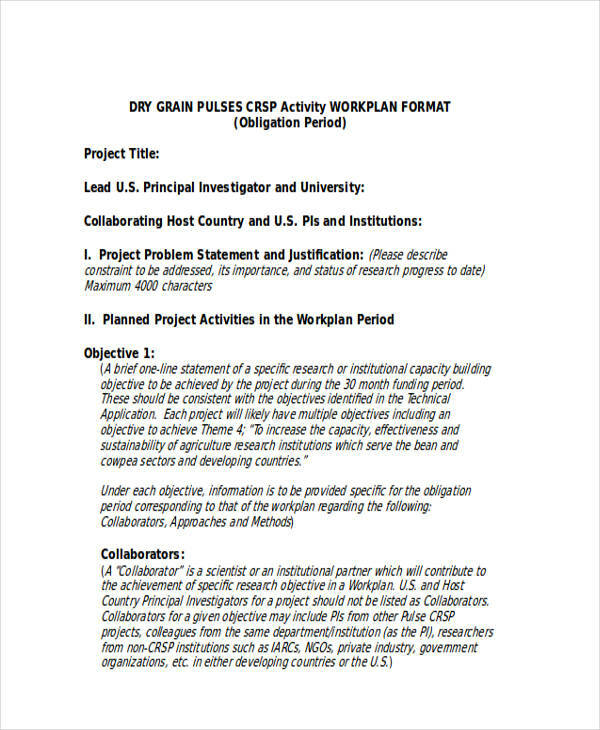 Project work plans will allow student schedule to know how these criteria can be met within a time period. 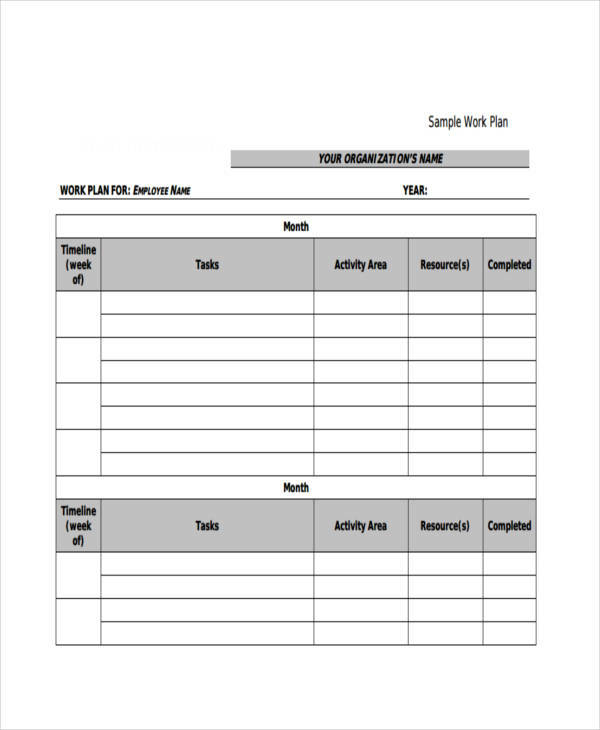 It can be a work plan created to improve the performance of an organization, a business or any large group. 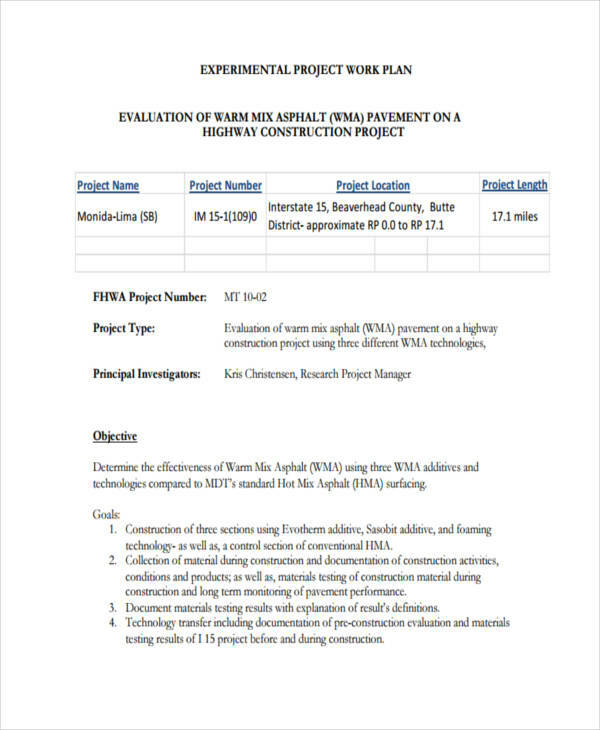 It can also be specifically made to develop the performance of an individual development plan who is involved within a particular process, function, or project. It is a necessary part of the management plan of the company. 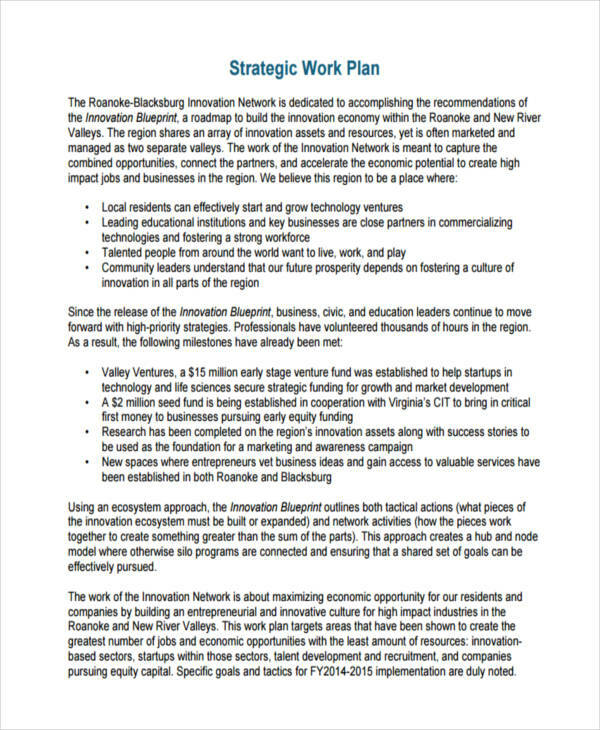 Having an effective strategic plan will allow entities to maximize and utilize the usages of their resources including funds and the workforce. 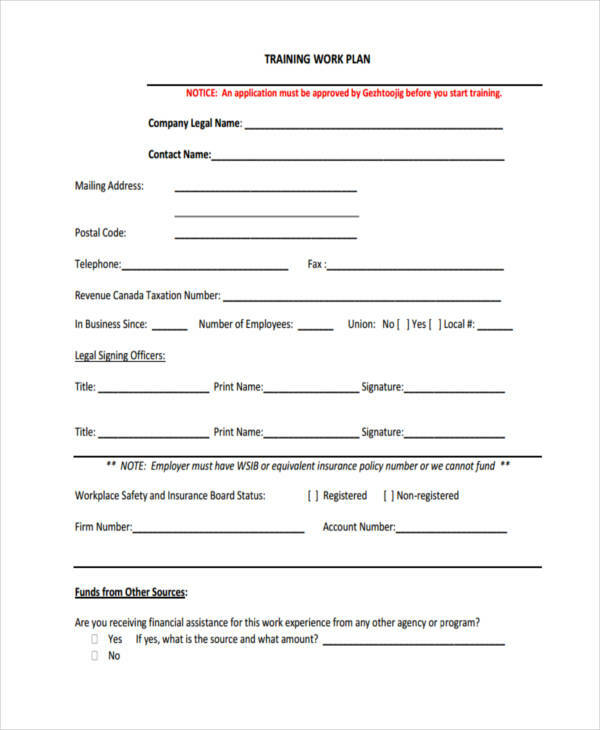 It can be given to a new employee so he/she can have a guide of the responsibilities that he / she should execute within the workplace. 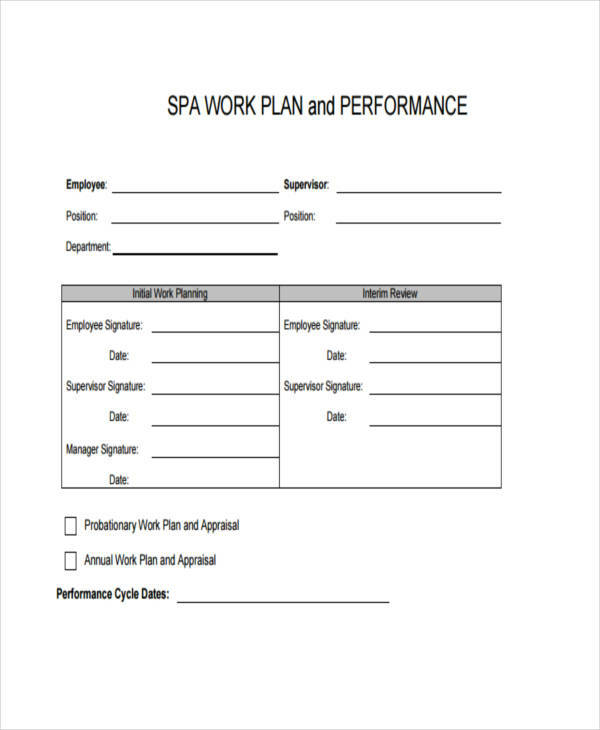 It can also be an employee work plan designed for the improvement of an employee’s performance based on previous evaluations and/or assessments. 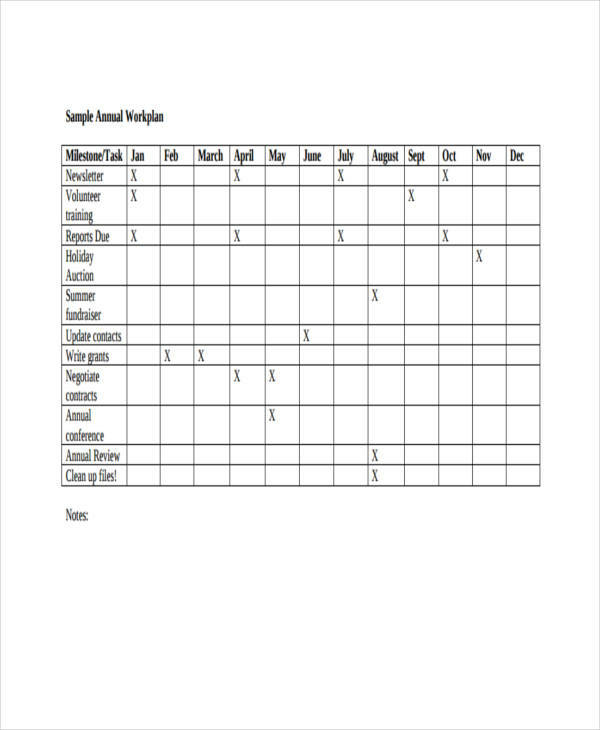 It can be an employee work plan usable for promotion purposes. 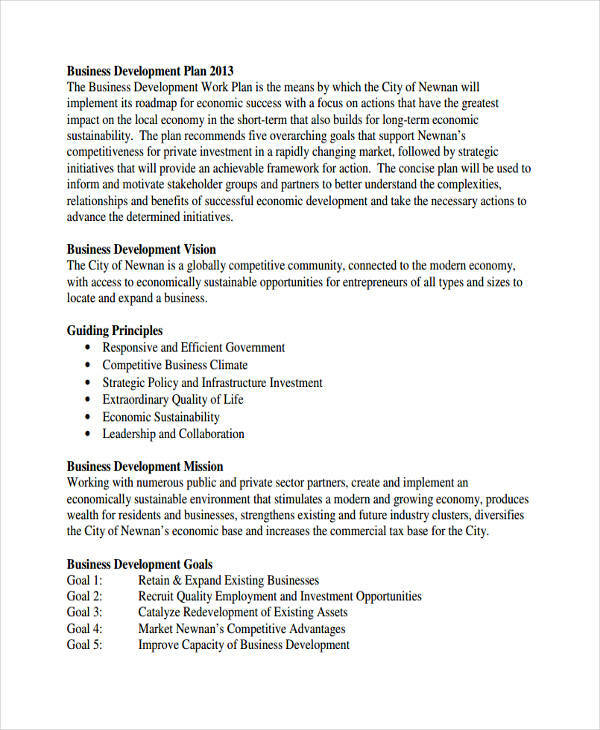 You may also see business plan examples. 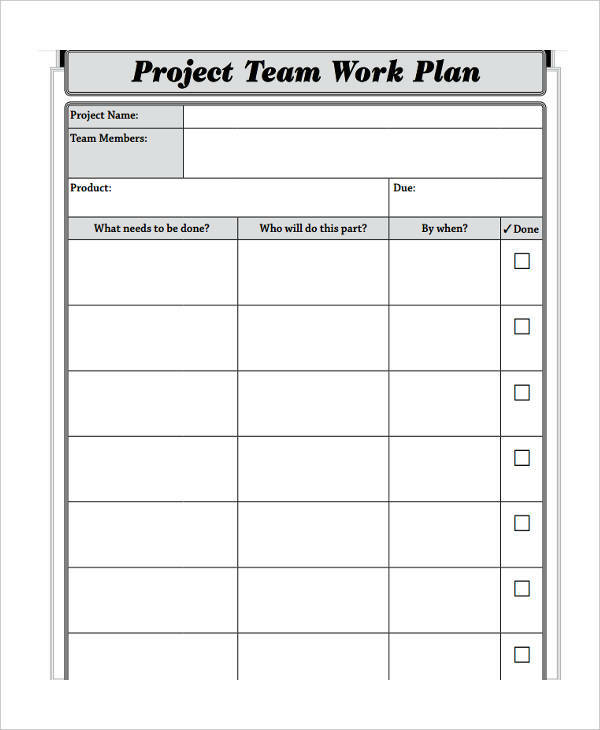 Just like a performance work plan, a development plan can be created both for groups or individuals. The only difference between the two is that a performance work plan can be applied on initial processes or transactions while development work plans are made based on results that are needed to be improved or developed. 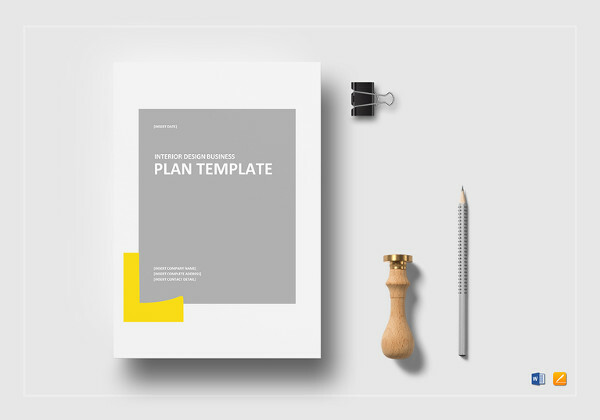 These are created for the purpose of guiding a company plan with the call to actions that they need to execute within a particular operational year. 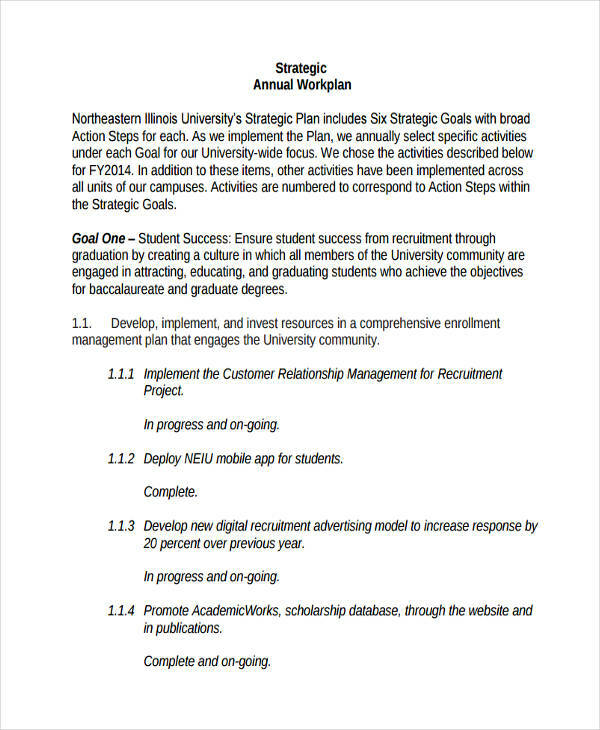 Annual plans are made by the head of business departments and are passed to the management for efficient collation and application purposes. It can be applied to the functions of small organizations especially those who need to meet on a monthly basis to talk about projects and other undertakings that are planned within a month’s time. 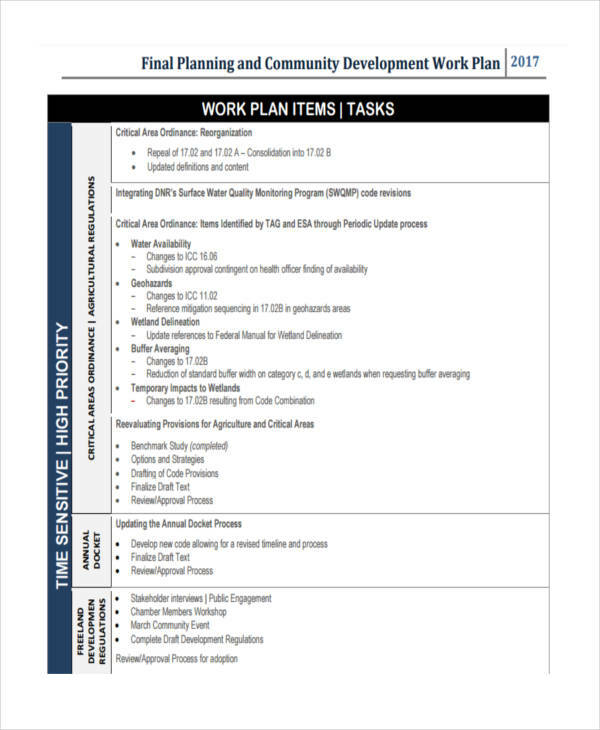 Monthly work plans should be able to put together the entire planning and execution processes that should be implemented to achieve the objective statement of the organization. 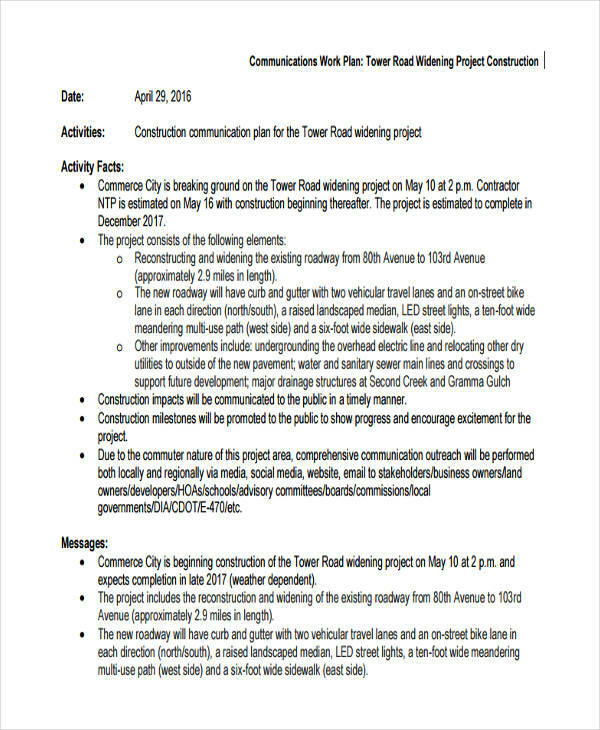 These are general plans used by individuals who like to assure that they are well aware of the responsibilities that they have in varying environments. 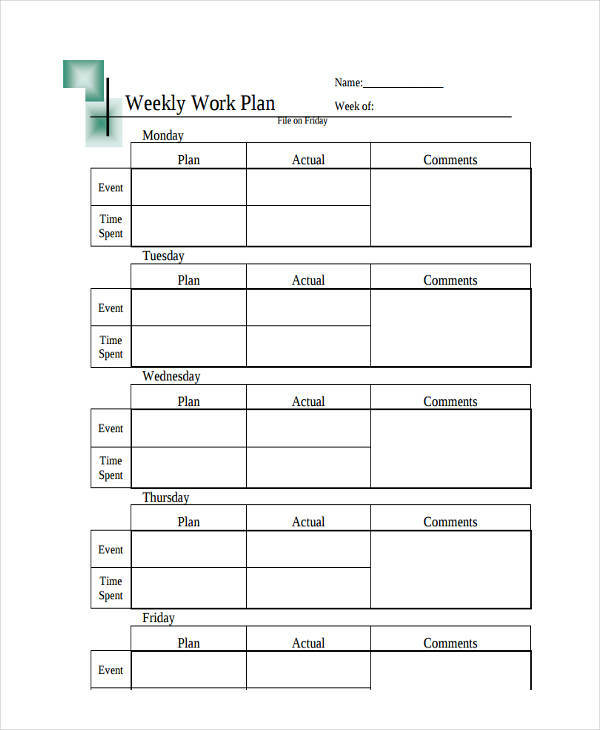 Daily work plans can be personal but they can also be applied in the work processes where an employee is involved. 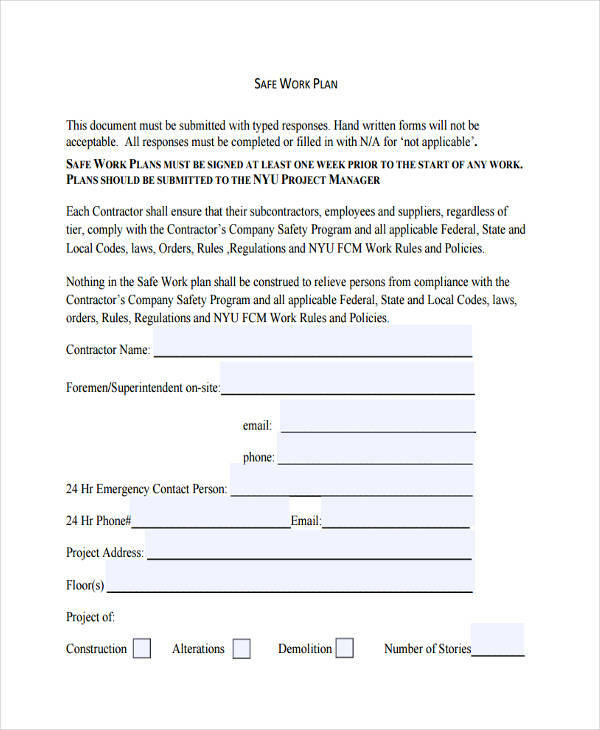 The usage of the above mentioned work plans can be interchanged depending on how they can help on the processes and functions of the entities who will use them.